How to play gigs for agencies/booking agents. Tips and tricks to get yourself on the roster and be in demand. What If I told you that you could be making more consistent tips at gigs WHILE also beefing up your social media following? I’m really excited to be sharing this with you today. It isn’t hard to do and you can start right away. 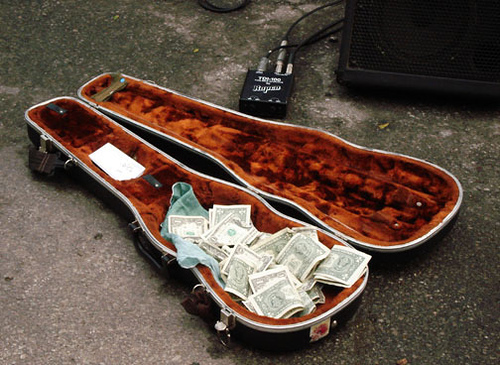 Playing live shows is a great way to make money as a musician, (One of the best if you ask me. For sure there are entry barriers when you begin. You have to be good enough that people will enjoy what you do. You have to have a good set list. You need to have a good professional attitude. These are all things you learn as you go though. You’ll never know it all from the onset so the most important thing is to just GET GOING WITH IT! Now that you are performing gigs (Click here to learn how to find gigs: PART 1 PART 2) here are a couple of easy tips that I know will seriously enhance this part of your game. Every little bit helps in this day in age where prices seem to be rising on everything. If this article is useful to you then I invite you to please like and share it. If you have something to add please comment down below...wayyyy down there! So HOW do you inspire people to be generous and give you a few bucks as a tip? Using some strategies that will make people more likely to tip. It’s good to think of tips as a bonus and not something that you use to measure your own worth. Most importantly, find a way to make people request songs more frequently, and find a way to make sure you will know the songs they ask for. As I’m about to show you it isn’t that hard. As some people will leave a tip when they request a song, let’s use that to our advantage. You need to make a song book. A song book is great because it let’s people chose requests from a list you’ve pre made. I think it has an edge on simply telling people, “Hey folks, feel free to make requests”. In my way people feel more in charge, it’s interactive (so…it’s fun), and you avoid awkwardly telling people “Sorry, I don’t know that song…(Crickets)”. Get a binder and some plastic sheet covers. In a word processor, make a list of all the songs you know how to play. I recommend alphabetizing this by artists (See the Example of a Song Book down below). Save the file, people will hold your book upside down and you will lose pages to trampling and wet floors from time to time. Print off your song list and place the pages into the clear sheet covers. Make a “Title/Social Media Page”, whatever you wanna call it. On this title page you can say a little about yourself (fight the urge to write a novel, lol it’s tough I know) Include your social media links. Put a little message on there inviting people to take a picture of the page so that they have all of your links saved in their phone (Instagram, Facebook, website, etc.). This is where you can increase your social media following easily and effortlessly while providing people with some info about you, followed by your song list. See below (under the “Example of the Song List” for my “Example of Title/Social Media Page”. You now have a Song Book…look at you! I like to start the night off with a 2-3 song medley of tunes that I know people will respond well to. “Sitting on the Dock (at the bay)” is a great song to start with, for example. When you see people smiling, singing a long, or tapping their feet then you know it’s working. Starting with a medley has the psychological effect of taking pressure off of the audience. It’s not like they have to clap for your right off the bat. After a 2-3 song medley you will have proved yourself to the crowd more, and given them a better value start, without require anyone to be the “first to clap” right away. You may be laughing but there is definitely a crowd psychology that exists in a venue full of people watching an artist perform. Warmly introduce yourself and let everyone know that it’s “great to be here to lay down the soundtrack of your evening. Please folks, feel free to help out by making requests from my Song Book over here”. Point out your song book which you’ve strategically placed RIGHT BESIDE your tip jar. People may not take you up on it right away. That’s the crowd psychology at work again. Once one person decides to have a peak in your book, others will follow. You can even pass the book to someone close (establishing a rapport with a nearby table of people while setting up helps break that ice, but make sure it’s appropriate. This doesn’t always fly, especially in ritsy venues). Throughout the night, reference your song book. As your audience gets more drunk they will be more bold and will be more likely to come make a request. People will be more likely to tip you as the tip jar is sitting right beside your song book. You will never have to tell people “I’m sorry, but I don’t know that song…(more crickets). Once one person tips…well you get it, crowd psychology comes into play once more. Before your last song give this a try… Let everyone know “This is my last song folks. It’s been so great playing for you tonight, and thank you so much for all of your generosity, I really appreciate that. My name’s Bradly Mitchell and you can follow me on social media. I hope to see you around again, have a great night” and then launch into your last song. That kind of references the tips/tippers and let’s people know that this is their last chance to tip if they were considering it. Flat out asking for tips can be a little tacky (in my opinion) and I try to avoid doing that. I’ve heard some guys and gals that are really good at doing just that. Unfortunately for me though, I’m not a natural salesman. That’s why I really love this method. It is more organic and has led to countless great nights where I have built a great rapport with my audience. I’ve made tons of tips as well as increased my social media following. There’s one thing I didn’t mention yet. I either know the songs of my songbook by heart or have the lyrics and/or chords in my iPad. You should see how quick I bring up the chords or lyrics to the next request while I’m still playing. That kills dead time between songs and is a generally good practice anyways. Dead time isn’t fun for anyone. Using an iPad for chords or lyrics has another advantage of helping you rapidly grow your song list. Every once in a while you are going to want to update your song list. I’m a singer/songwriter from Toronto. I play shows in all kinds of venues for a living. Tough life…I know 😉 It’s great to be here playing for you tonight! Have fun choosing songs from this list for me to play. Below are my Social Media Links. It would be really friggin’ awesome if you would follow me online and perhaps come out to see me again sometime! Feel free to take a picture so that you have all the links in one place. Any tip donations are very much appreciated. Most importantly, I hope you have a killer night tonight and that I see you again soon! So that’s it! Please smash the like and share using the buttons below to spread the good gospel to our musician friends around the world! This was a fun article to write and I sincerely hope it really helps you to do great work and make some extra dough. Getting tipped is super flattering too! Keep up the great work. Great article, some really great tips there! Would you take this approach with a paying gig,or just one that you were playing for tips? I do this at paid gigs. Playing shows is mainly how I make my money so when I’m playing gigs (for pay of course) I use this method. Good luck Sherri! !